VILLA SISTEMI MEDICALI Group ("VSM") an Italian worldwide provider of medical and dental imaging solutions has announced that it has entered into an exclusive negotiation with ACTEON Group to divest its Dental Division. ACTEON Group is a French MedTech company specializing in high-tech dental and medical devices based in Merignac. 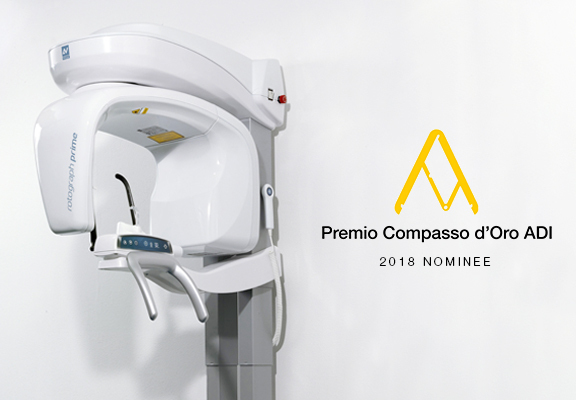 The VSM Dental Division, based in Milan, designs, manufactures and markets digital imaging equipment such as PAN (panoramic X-Ray device) and CBCT (3D scanner), under the VILLA SISTEMI MEDICALI and OWANDY brands, and generates a global annual turnover of nearly €20 million. With this transaction VSM will focus on its medical imaging business. The financial resources made available by this transaction will allow the development of important projects that will support the growth of VSM. VILLA SISTEMI MEDICALI Group is an Italian worldwide provider of medical and dental imaging solutions. VSM employs 160 people. Through its subsidiaries OWANDY and VILLA RADIOLOGY SYSTEMS Inc. , the group can count on three representatives offices based in Paris, Madrid and Middlebury (CT) – U.S.A.
VSM is manufacturing in its production site based in Buccinasco (MI) – Italy. VSM is present in more than 100 countries through a valuable network of Distributors. ACTEON is a French MedTech company specializing in high-tech dental and medical devices. Based in Merignac, the Group has become a leading global player thanks to its cutting-edge innovative technology. ACTEON employs 720 people, almost half of whom are outside France. They are spread across 4 manufacturing plants, 13 branches and 16 representative offices established in the main global markets. The Group has a well-established and rigorous quality policy focused on customer satisfaction and innovation, in strict compliance with the applicable international regulations and standards. We would be pleased to welcome you at our booth, located in Expo X5, number 502, where we will be at your disposal to present our products. We would be pleased to welcome you at our booth S2.C60, where our staff will be at your disposal to present our products. Our staff will be waiting for you at our traditional location, booth D74 in Hall 10, to present our products. We would be pleased to welcome you at our booth, number 207-209, where we will be at your disposal to present our products. We would be pleased to welcome you at our booth 2J36, where our staff will be at your disposal to present our products. We are pleased and proud to announce that our Rotograph Prime has been nominee for the prestigious "Compasso D'Oro 2018" award. Designed and built in collaboration with the well-known "Studio Volpi", the Rotograph Prime project proved to be absolutely innovative in the dental X-ray scene, as it was the first wall-mounted panoramic unit. Its new and futuristic design has been able to combine lightness with ergonomics and beauty with functionality; for these reasons it has been identified by the ADI (Industrial Design Association) as one of the nominee products for the most prestigious design award of the world. The success of international sales is now supported by the recognition of this prestigious association, which every year selects and awards only the best design products in the world. Milan, Italy – March 7, 2018 – Villa Sistemi Medicali has announced the new mobile application “RAD/AR”, a revolutionary promotional and sales tool that uses Augmented Reality to show the functioning and applications of its radiology systems in the real environment. Villa Sistemi Medicali, characterized by its strong propensity for innovation, has decided to invest in the use of the latest augmented reality technologies first in its industry, to promote its products in an unprecedented and effective way. In collaboration with Realmore (business unit of Equent Media Group) and MCommunication, Villa Sistemi Medicali has developed "RAD/AR", an application for smartphones and tablets that uses these technologies in an original way to visualize and integrate in the real environment the three-dimensional models of its equipment, showing their functionalities and possible applications. RAD/AR is therefore a powerful information tool for customers, and a revolutionary working tool for the commercial network, supporting in a simple and intuitive way the communication, sales and staff training activities, allowing also to work remotely, with consequent reduction in costs and working times. The “RAD/AR” app, premiered at the European Congress of Radiology 2018 in Vienna, is already available for download from the AppStoreTM and Google PlayTM. Saturday, February, 17, Mr. Alfio Villa passed away. Mr. Villa was the founder of our Company that has proudly carried his name for 60 years. Alfio Villa was a bright example of Italian Enterpreneurship, always ready and able to "do" and achieve excellence in his field. He was highly recognized and esteemed by everyone whose path he crossed, be they Customers, Employees, Competitors or Friends. 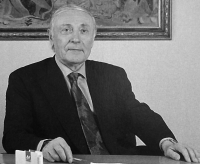 Those who had the fortune to know him will not forget his positive and innovative mindset and the uncompromised dedication he had for his Company and for his Employees, to whom he dedicated his whole life, together with his beloved daughter Mariacristina. We would be pleased to welcome you at our booth, located in Expo X2, lower level, number 219, where we will be at your disposal to present our products. We would be pleased to welcome you at our booth 6F14 where our staff will be at your disposal to present our products. Our staff will be waiting for you at our traditional location, booth D74 in Hall 10, to present our products: the new Apollo DRF 4.0 remote-controlled system, Moviplan iC general radiographic system and Rotograph Prime 3D digital panoramic unit. 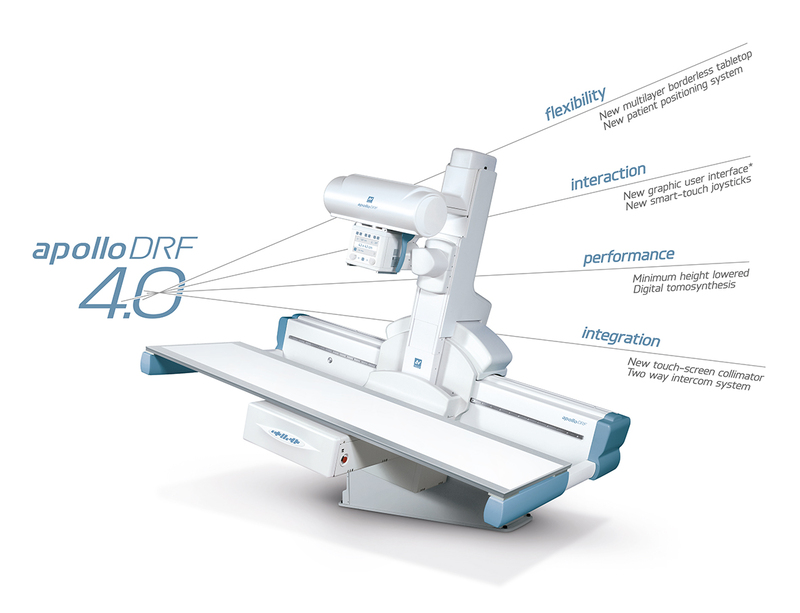 The new Apollo DRF 4.0, premiered during ECR 2017 exhibition, earning a great success among visitors and partners, is a totally renewed version of the well-known digital remote controlled table, where a series of improving actions and cutting-edge technologies have been applied to enhance system’s performance and ease of use, as well as to increase its flexibility and diagnostic capabilities. Thanks to this deep system upgrade, the users will benefit from a significant workflow improvement and better diagnostic results in less time. The implementation of a new borderless patient tabletop simplifies the patient transfer from the stretcher, while the substantial height reduction from the floor improves the patient accessibility to the table. The operator interaction with the equipment has been made even simpler and faster through the introduction of the new touch screen collimator, showing at a glance the main system controls and information. The graphical user interface of the imaging software has been completely redesigned, with the integration of main generator controls and with the display of the patient positioning trhough the camera placed inside the collimator. Moreover, the renewal of the control console has improved its performance and has allowed the integration of a two way intercom system, which makes possible a correct and fast examination thanks to the direct communication with the patient and the availability of preset multilingual audio messages. Even the safety level during the system use has been increased through the introduction of smart-touch joysticks, which are operated only by human touch, thus avoiding unintentional movements of the equipment. Finally, the diagnostic capabilities of the new Apollo DRF 4.0 have been expanded with the introduction of the digital tomosynthesis, an innovative imaging technique able to obtain detailed volumetric reconstructions, while the system application flexibility has been increased with the possibility to use different wireless Flat Panel for direct and off-table exposures. The new Apollo DRF 4.0 will be available soon. Further details will be provided before the official product release. We would be pleased to welcome you at our booth, located in Hall 11.1, booth F034, where we will be at your disposal to present our products. We would be pleased to welcome you at our booth, located in Expo X2, lower level, number 20, where we will be at your disposal to present our products. We would be pleased to welcome you at our booth (6F14), where our staff will be at your disposal to present our products. We would be pleased to welcome you at our booth (S2C70), where our staff will be at your disposal to present our products. solution, as well as the same 2D imaging capabilities. In the same way as the Prime, also Rotograph Prime 3D has been designed as a comprehensive diagnostic tool, allowing an easy transition to the most advanced dental imaging technologies through an affordable investment for everyone. Villa 3D Planner is a complete imaging solution intended for diagnosis, support for orthognathic surgery diagnostic procedures, preparation of dental implantation procedures, 3D visualization of bone structures, planning and simulation of anatomical changes during stomatognathic surgery. The broad working area enabling multiple views (dicom, panoramic, superimposition, single) improves the diagnostic possibilities thanks to the high-quality reconstruction, the powerful tools for image enhancement and the advanced measuring functions. Villa 3D Planner’s user friendly interface will assist you like never before in the assessment of bone and dental pathology, including fractures, impacted teeth, periodontitis, TMJ disease. Villa 3D Planner works by superimposing a working model with DICOM data to help you pinpoint the correct implant size and position far more accurately than was ever before possible. Visualise nerve channels and determine angulation for surgery with higher accuracy and predictability. It’s a precise tool for quick formation of surgical guides, and even helps you to locate and avoid nerve channels. Dental drill guides improve implant surgery accuracy and speed, and they reduce the risk of patient discomfort. They help dentists with less implant experience to achieve better results with more confidence, and the patients are guaranteed an optimum level in dental care. The resulting digital model can be produced in a standard format that any 3D printer or milling centre can use. You can try our new software, please visit its dedicated section inside Rotograph Evo 3D page, where you can find a link to download a demo version of Villa 3D Planner. Our staff will be waiting for you at our traditional location, booth 10D74 in Hall 10, to present the products shown in our stand: new Moviplan iC radiographic system, new Visitor T40 M-DR digital mobile unit, new fluoroscopy C-arm Arcovis 3000 R9 15kW and Rotograph Prime digital panoramic unit. Villa is pleased to announce the the introduction of the digital mammography system with tomosynthesis Melody IIID TS. Tomosynthesis is an innovative technology that can overcome the weakness of conventional mammography, because it improves detection and characterization of breast lesions especially in women with high breast density. Thanks to the display of reconstructed thin anatomical sections, it allows to unmask lesions that in conventional 2D projection could be obscured by surrounding tissues. It is our pleasure to invite you to attend IDEM 2016 (booth 4A-14), the most influential meeting dedicated to dental healthcare, where our specialists will be glad to present you our products. We would be pleased to welcome you at our booth, located in Expo X2, lower level, number 326 , where we will be at your disposal to present our products, focusing particularly on the units shown at the booth: Moviplan iC general bucky room, Apollo Open DRF remote controlled table with dynamic flat panel, Rotograph Prime panoramic unit. Concurrently with Rotograph Prime introduction, starting from the 26th January 2016, Rotograph D and Rotograph Plus will be discontinued. Even if they will be no longer available in our product portfolio, Villa will continue to provide spare parts and support for the next 10 years from now. Villa is pleased to announce the official availability in our product portfolio of the new digital panoramic unit Rotograph Prime: a device with a functional and original design, whose peculiarity lies in the perfect balance between efficiency and innovation. We kindly invite you to discover all Rotograph Prime features in its dedicated page of the website (http://www.villasm.com/en/art/174/rotograph-prime.html). In addition, many documents about this product, such as brochure, different presentations, product data and more, are available in the Reserved Area. We would be pleased to welcome you at our booth (6C05), where our staff will be at your disposal to present our products. We would be pleased to welcome you at our booth (number S2C70), where our staff will be at your disposal to present our products. Rotograph Prime is the new generation of digital panoramic unit, featuring a creative and innovative design. 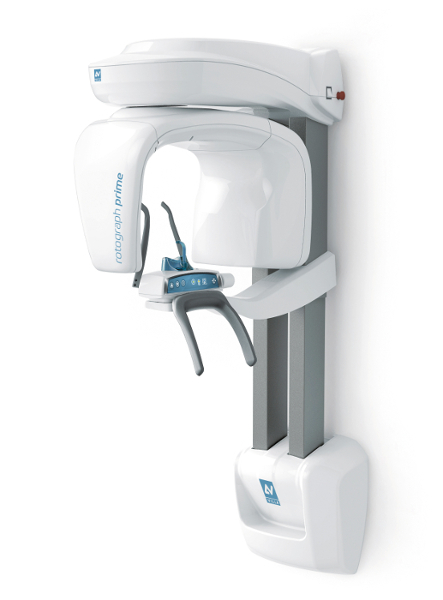 A unique and effortless wall mounting solution, combined with a lightweight framework and a compact footprint, allow Rotograph Prime to be easily and quickly placed in almost any dental practice. 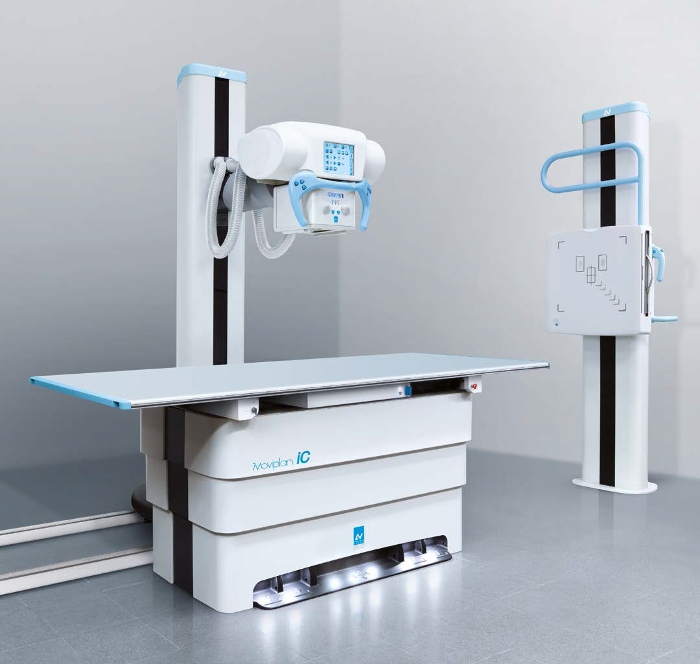 The operator can get a precise patient positioning thanks to the motorized telescopic column, the face-to-face positioning and the 2 laser beams centering system. The chin rest with bite stick and the two lateral temple supports keep the patient stable while the focal layer position is automatically adjusted following the selection of the dentition morphology. Thanks to the absence of a floor base and the wide range of its vertical movement, Rotograph Prime is accessible to every standing or seated patient. The virtual control panel is based on an user-friendly interface, designed to operate also with touch screen monitors. The intuitive graphic layout with icons leads the user to each function in just a few simple steps. The state-of-the-art digital sensor provides clear and sharp images at low dose levels, for a superior image quality. The full set of examination programs make Rotograph Prime an affordable and complete unit able to cover all needs in panoramic radiography. Villa is ready for the worldwide premiere of its high-end General Radiology system: the totally new Moviplan iC. Moviplan iC is available in a wide range of configurations that cover all user's diagnostics needs making it a precious tool during medical investigations. In the entry-level version, analog with fixed-height table, the control interface is managed by an LCD panel, while the table unlocking is controlled by the appreciated photocell system, typical of Moviplan units. The standard Potter-Bucky, integrating a high-quality oscillating grid, can be configured to be automatically centered under the X-ray source, to maximize the efficiency of the machine. The absence of unsightly cables plays an important part in the attractiveness of the design, while maximizing the safety for operators. Obviously, this machine is also ready to work digitally, for example simply inserting a portable Flat Panel detector. Autotracking functions permit to keep constant the value of the Source-Image-Distance and the alignment tube/receptor. Moviplan iC can gradually evolve into the most complete and efficient configuration, becoming a digital system totally automatized. The elevating table, with a wide vertical movement, allows to manage even the most critical patients; the commands for lift movement and table unlocking are activated through the peculiar light barrier, highlighted with cool white lights. The user interface is managed with a Touch Screen controller through which it is also possible to select the tomographic exams and all auto-tracking functions. Tubes and generators, specifically tested and certified by Villa Sistemi Medicali, are available to be integrated into the system. Power values from 32kW to 100kW are ready to match every configuration required. Moviplan iC can be provided with the x-ray tube mounted on the floor column or with one of our ceiling suspended tube supports, while wall buckies are available as tilting or fixed.